A unique undertaking:To celebrate the words that have shaped America. Publishing authoritative new editions of American literature. Preserving the words that built America. Championing America's greatest literary voices. Pushing the boundaries of the American literary canon. Library of America, a nonprofit organization, champions our nation’s cultural heritage by publishing America’s greatest writing in authoritative new editions and providing resources for readers to explore this rich, living legacy. Widely recognized as the definitive collection of American writing, Library of America editions encompass all periods and genres—including acknowledged classics, neglected masterpieces, and historically important documents and texts—and showcase the vitality and variety of America’s literary legacy. Additional public programs, digital resources, and community partnerships help readers worldwide make meaningful connections with the nation’s written heritage. More than a publisher, Library of America is a vital part of the cultural landscape—an invaluable portal through which the words and ideas that formed and continue to shape America can enrich our lives for years to come. 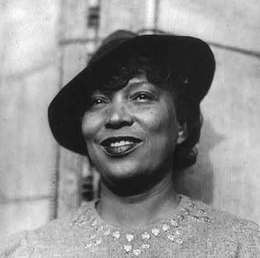 LOA’s edition of Zora Neale Hurston features her 1942 autobiography, Dust Tracks on a Road, presented for the first time as Hurston intended, with controversial passages restored and four never-published chapters. 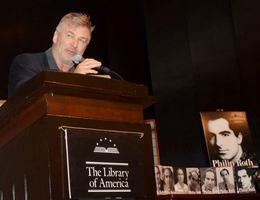 Alec Baldwin joined LOA in a celebration of Philip Roth’s writing on the occasion of the writer’s 80th birthday. “America is hard to see,” poet laureate Robert Frost famously wrote. Although in this poem Frost alluded to Columbus’s difficulty in navigating toward these shores, his words resonate with the continued challenge of clearly understanding a nation so diverse and so complex. How, then, do we gain a true view of America? Taken together, the writings of the Founders, the poems of Frost and Walt Whitman, the novels and stories of Mark Twain and Edith Wharton, the slave narratives of Frederick Douglass and William Wells Brown, the essays of Henry David Thoreau, James Baldwin, and Susan Sontag, the speeches and letters of Abraham Lincoln and Theodore Roosevelt, the lyrics of Cole Porter and Ira Gershwin, and many other exceptional works of American writing begin to reveal the country’s multi-faceted identity. These writings are our shared birthright. Everyone should have access to the enjoyment and enlightenment they provide. Yet the closing of brick-and-mortar bookstores and the loss of many book review pages have greatly eroded the potential for people to browse and discover important books. Through the mainstream media, readers learn of only a handful of the most popular and bestselling books. While millions of titles are now available in libraries and through online retailers, there are few places to turn for guidance in finding and appreciating the exceptional writing that best reflects this country's history and culture. To address this need, Library of America publishes carefully curated editions of works by the greatest and most significant American writers and develops nationwide and international initiatives to help readers discover these timeless works. In New York City, we also engage readers in a deeper appreciation of American writing with local programs on literary and historical topics and their continued relevance. Readers value the timeless works published in Library of America collections and can encounter this writing in a variety of ways. We serve thousands of subscribers to the LOA series and to LOA’s free digital Story of the Week. LOA volumes are available in bookstores and online retailers and in public libraries and universities worldwide. To date, more than 8 million copies of Library of America volumes have been sold. Library of America was long a dream of the literary critic Edmund Wilson (1895–1972), who was concerned that many works by America’s best writers were either out of print or nearly impossible to find. Without a deliberate publishing effort to preserve American writing and make it widely available, many important works would disappear from the cultural conversation. As a consequence, deprived of an important part of their cultural inheritance, Americans would lose a collective sense of the country’s literary accomplishments and the vital role writing has played in our history. 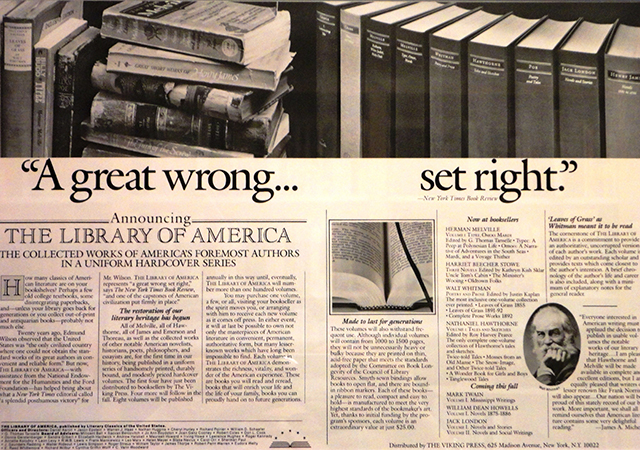 Library of America ran this ad in The New York Times in 1982 to announce its mission and its first published volumes. The Pléiade series—published in France since the 1930s—provided a model. Discussion of a similar American series began in the 1950s and continued until the late 1970s, when the National Endowment for the Humanities and the Ford Foundation provided seed funding to create Library of America. LOA’s first volumes were published in 1982. Among the writers and scholars who served on the initial board of advisors were: Robert Coles, Irving Howe, R.W.B. Lewis, Robert Penn Warren, Eudora Welty, and C. Vann Woodward. The LOA series has earned the Carey-Thomas Award for Creative Publishing and the National Book Critics Circle special award for “distinguished contributions to the enhancement of American literary and critical standards.” It has also received the “Ambassador of Honor” title multiple times from the English-Speaking Union.